Moscato is an Italian dessert style white wine made from the muscat grape. Similar to the Spanish moscatel and the French muscat, it is sweet and fruity with hints of the honey and those qualities inspired my recipe for this cocktail recipe. Though muscat grapes are the oldest known variety and wine made from it has been popular for ages, it's gotten a recent surge in modern day popularity thanks to brand linked rappers and hip hop artists. 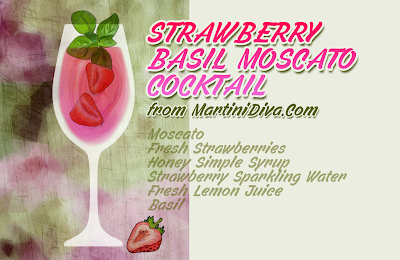 Since it's already hitting triple digits here in Tucson, I thought some moscato would pair nicely with the classic combination of fresh strawberries and some fresh basil from my herb garden for a refreshing summer cooler. Adding a little effervescence with some strawberry sparkling water and a bit of sweetness with some honey, I ended up with a pleasant late afternoon cocktail. DIRECTIONS: Warm the honey and water in a highball glass in a microwave just long enough to thin the honey and mix together, about 10 seconds. Add the strawberries and basil to the glass then gently muddle. Fill your glass with ice then add the Moscato, stir. 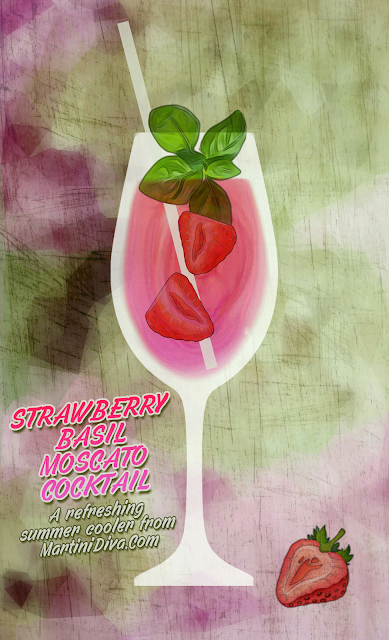 Top off with the strawberry sparkling water, garnish with a fresh strawberry, a sprig of basil and serve. National Moscato Day is May 9th.